Laan van Poot 486 A Price asked € 389.000 k.k. Opposite the dunes and beach entrance, beautiful 6-room CORNER-maisonette on the 1st and 2nd floor with open kitchen, 3 bedrooms, modern bathroom and all around beautiful unobstructed view! The appartment overlooks a dune lake in the Westduinpark ( part of National Park Hollandse Duinen). The lake attracts all kinds of wild life like Scottish Highland Cattle, Foxes and Birds of Prey. Fully equipped with wooden window frames with double glazing. Through front garden and communal vestibule entrance, stairs to the 1st floor. Open landing to the spacious living room and open kitchen approx. 11.45 x 3.47 and partly approx. 2.55 x 5.61 with great view to the dunes and parquet flooring, travertine fireplace and open kitchen with a L-shaped kitchen unit with 4-burner gas stove, oven, extractor hood, sink, fridge and dishwasher. Corridor with modern toilet, 2 fixed cupboards with position for the c.v.-combi boiler . Bright room in the back approx. 2.78 x 2.54 with access to sunny balcony approx. 2.38 x 1.05 facing southeast. Landing, spacious luxury bathroom approx. 4.84 x 2.09 with large bath, walk-in shower, beautiful washbasin, toilet, design radiator, floor heating and connection for the washing machine. Spacious bedroom in the back approx. 6.04 x 3.55 with a large dormer window and via loft ladder access to loft. Bedroom in the front approx. 4.23 x 3.55 with dormer and second room in the front approx. 3.07 x 2.09 with also a great view overlooking the dunes. Sewerage charges 2018 € 139,55 per year. 4/8th share in the community. Active Owners Association, contribution € 100,-- each month. Electricity 12 groups including 3 circuit breakers. Central heating system, brand Remeha, built in 2010. Hot water supply by central heating system. The condition of the bathroom and the kitchen is good. The condition of the interior and exterior is good. The apartment has wooden window frames with double glazing ( HR++). The lead-/asbestos and age clauses will be applied. Living surface approx. 122 m². The volume of the apartment approx. 429 m³. Shops at the Savornin Lohmanlaan, Mezenlaan, Goudsbloemlaan, Boulevard of Kijkduin, sports facilities, “Bosjes van Pex” and steps away from the dunes, beach and sea !! Public transport (bus 24), main roads through Westland Road and Hubertustunnel. Near International School of The Hague, European School of The Hague, schools and various sports facilities including tennis, football, hockey, handball and horseback riding. The measurement instruction is based on NEN2580. The measurement instruction is intended to apply a more uniform way of measuring for giving an indication of the use surface. The measurement instruction can not completely close differences in measurement results, for example by differences in interpretation, rounding or limitations in the performance of the measurement. 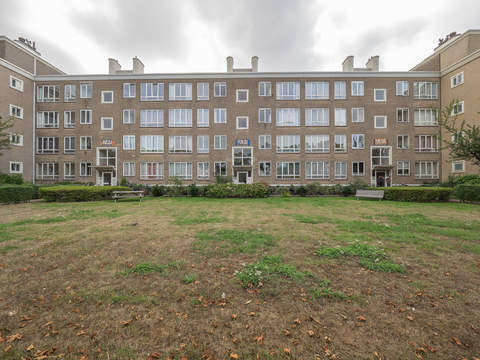 Wilt u meer weten over deze woning of een bezichtiging plannen? Bel of mail ons of vul het formulier in.